It only took me a little mixing and less than 30 minutes to make them! Mamon is the Filipino version of sponge cake which is really soft and tasty. What makes Mamon different from regular sponge cake is that they are baked in small molds which are good for individual servings. 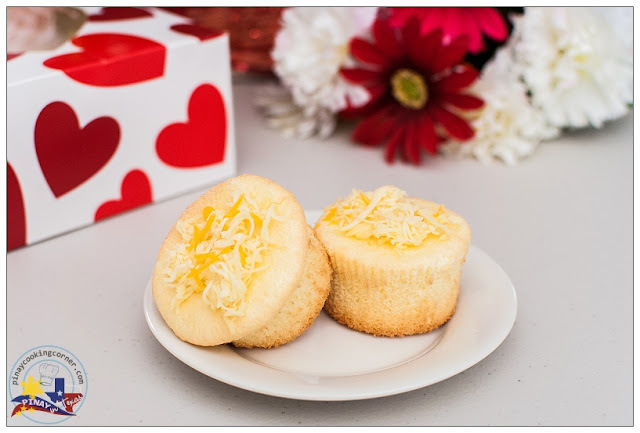 They are usually served for merienda (snack), and can be eaten plain or topped with butter and grated cheddar cheese. The ones with toppings are what you call Mamon Espesyal (Special Mamon). When I was growing up, only the regular Mamon was available. I was already in college when I first got to try the one with toppings. Well, I honestly love them both...and believe me, they make perfect gifts for any occasion. Follow these easy steps (adapted from Goldilocks Bakebook) and enjoy Filipino-style mini sponge cakes yourself! 1. Preheat oven to 325F. Line muffin pans with paper cups. 2. In a bowl, cream 1/4 cup butter and 1/3 cup sugar using a mixer on high speed. Add egg yolks and 1/4 cup water. Mix until well combine. 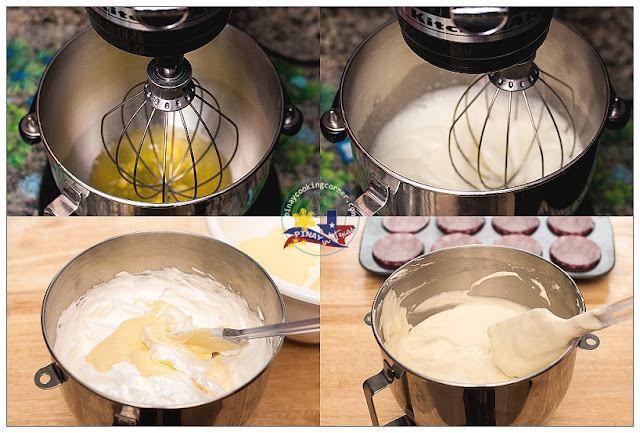 With the mixer on low gradually add cake flour, baking powder and orange extract, and continue mixing until well blended. Set aside. 3. In a separate bowl combine egg whites and cream of tartar. Beat on high speed until soft peaks form. Gradually add the remaining sugar and continue beating until stiff. Fold in the yolk mixture into the egg white mixture. 4. Divide batter into prepared muffin pans, filling until 3/4 full. Bake for 15 minutes. Once baked, removed from pans and transfer to wire racks to cool. Brush top of mamon with remaining melted butter then sprinkle with grated cheese. These are just so sweet and pretty, Tina. I love super soft mamon but I like the tostado, too. They are classic comfort merienda food. Oh I love mamon tostado too, Adora! Perfect for tea time! What perfect Valentine cupcakes! I've missed stopping by...so nice to see a comment from you today, Tina! Wishing you and your family a wonderful weekend! 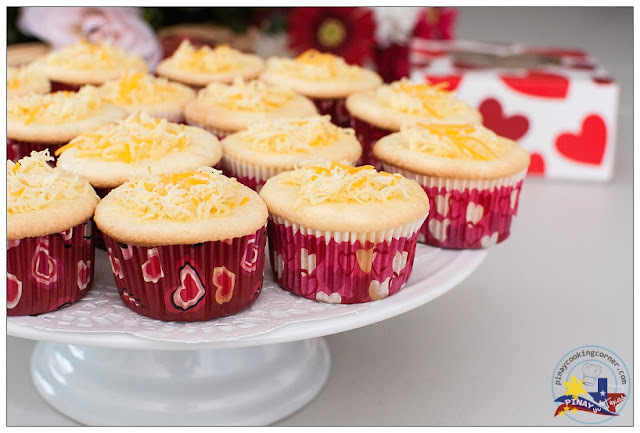 How interesting, so these cakes are sweet and topped with cheddar cheese.. They look so soft and light! Nice and lovely cakes Tina. I seldom bake but your recipe is very tempting because I think I should be able to follow through. Will attempt and let you know the outcome. Love those cupcakes Tina. Very well presented .... a nice valentine day's treat. Delicious cake love it. They are spongy and moist. This is a dreamy dessert. 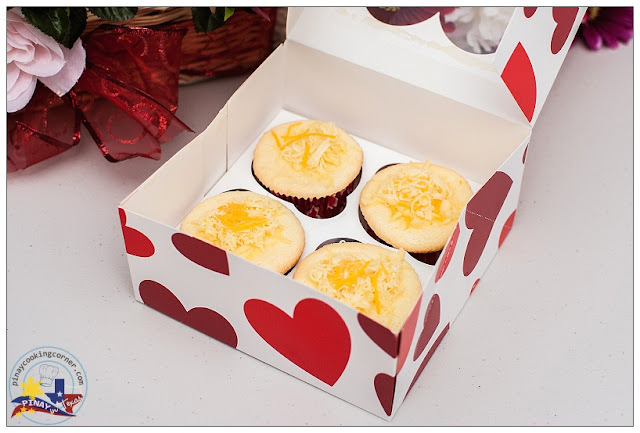 Interesting to know this is a Filipino tradition to eat these soft and fluffy cupcakes with buttery cheesy toppings. Indeed, these look truly wonderful for Valentine's day. Hi thank you so much for sharing this recipe....I just have a question can I substitute cake flour with all purpose flour? Or would it ruin the texture? Thanks! Yes you may, but there'll be a slight difference in softness and texture. I made this today and its really a big hit w/ my family..
Hi there! I was wondering if the 5 tsp of OJ extract can be substituted with freshly squeezed OJ? yes. I actually used freshly squeezed orange juice. Thanks for replying! Just made these tonight and they were delicious! Only thing is, mine seemed to have shrank after cooling. I filled them 3/4 full before putting it in the oven but they never rose higher than the cups like yours did. Any ideas why? I'm gonna try again tomorrow and fill it more so hopefully it'll look like yours! I can't tell you the exact reason why it happened. But do check the baking powder you used and make sure that it's not outdated. You should also see to it that you don't overbeat the egg yolks and the egg whites...be sure to fold them just enough. And lastly, you can try keeping the mamon in the oven for about 10 minutes after baking (with the oven door slightly opened) just so it can shrink slowly before you take it out and not become too flat. Thank you for sharing the recipe. I just made this, and they turned out perfect. 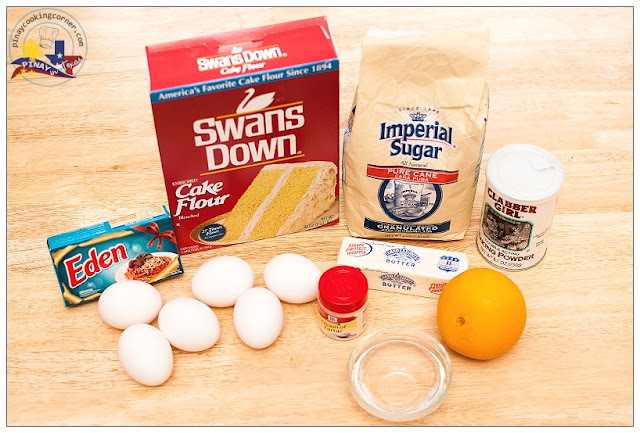 I substituted lemon for the orange extract, as well as wheat flour. But they still turned out really good. Can u use 'veg. oil than butter ? Using vegetable oil will give your mamon a less spongy texture.